Yakuza, or Ryu ga Gotoku as it’s known in the native land of Japan, follows the trials and tribulations of Kazuma Kiryu through each numbered release. Through the more than ten years since its first release on PlayStation 2, Kiryu has laughed, cried, and pummeled the opposition as he worked his way up to becoming the so-called Dragon of Dojima. As implied by the name, Yakuza 0 brings the story back to its roots and lays the prequel foundation for events to come. With Kiryu and fellow Tojo clan patriarch Goro Majima, the fight for control of Kamurocho is only just beginning. Set during the bubble economy of the 1980’s, cash flows like water and anyone with a net big enough can try to reap its rewards, yakuza and citizen alike. Framed for murder, Kazuma Kiryu is ostracized from his family and set loose as an ex-yakuza from the Dojima family on less than amicable terms. With a small plot of land known as the ‘Empty Lot’ set as the scene of the false murder, all of the major players in Kamurocho are gunning to own that crucial piece of property and strengthen their hold on the city of night. On the other side of the coin, Goro Majima, a tortured soul with a tragic history, is clawing his way back into the good graces of the Tojo clan by any means necessary. With the story revolving around ‘The Dragon & The Tiger,’ events will transpire that ultimately affect the cities of Kamurocho and Sotenbori and all that call these towns home. By establishing Yakuza 0 as a prequel, curious fans will find a chance to step into Kamurocho that’s far more accessible than any other title in the series. 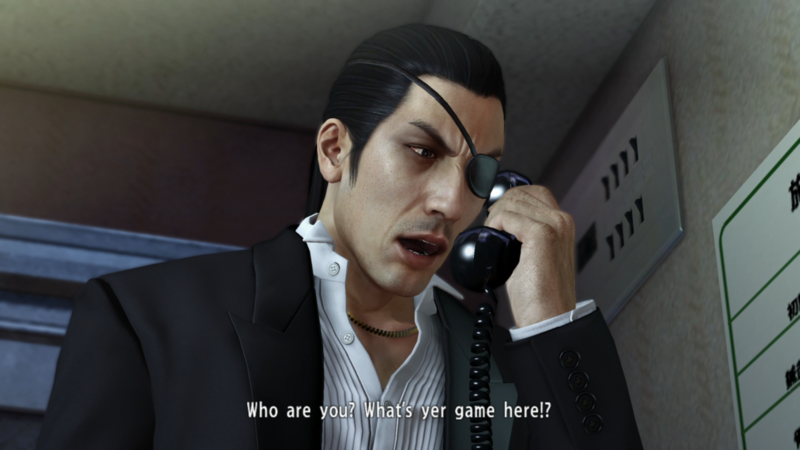 Key players from later chapters in the Yakuza series make their first appearances in the nightlife and questions about their origins might finally be answered: how did Majima lose his eye? Who gave Kiryu his terrible sense of fashion? How can a guy just walk away after getting a motorcycle thrown at him and subsequently being stomped down? The answers to those questions almost always come down to using your fists to find out the truth. When not indulging in the local nightlife, Majima and Kiryu alike have to brave the gang-infested streets and fight for survival through any means necessary. Any time a fight comes their way, battles commence right where they stand, turning into their own little battleground. Most signs and objects around can be used as weapons, each with their own unique finishing moves, as well as weapons that can be equipped and brought into battle (though their durability is laughably low without investing into the proper abilities). Yakuza 0’s flow of combat feels like a classic arcade brawler brought into the modern era. Movement is quick and responsive and combos flow with the square and triangle buttons primarily. Camera control can be a bit finicky when surrounded by enemies, although the lock-on system tries its best to keep the action focused in one place. Both of the playable characters have multiple fighting styles that can be swapped at a moment’s notice and are best suited to the type of opponents faced, whether it’s a group of hooligans or a boss whose life bar triples Kiryu’s. Brutal combat has been one of the main staples of the Yakuza series, and Zero certainly could prove to be a little too much for those who faint at the sight of blood. While Kiryu never explicitly kills his enemies, I find it hard to believe that someone who has been curb stomped simply walks it off with a bloody nose and empty wallet. The twin cities of Sotenbori and Kamurocho feel like living and breathing communities and not simply dots on a map. Even when just hailing a taxi to one of the far corners or hoofing it to the next story destination (and hoping that you don’t get thrown into a random battle just because you bumped into the wrong person), there’s a soul to the city that’s unmistakably part of the Yakuza blood. From cabaret barkers that want to offer you pocket tissues on the street to roaming gangs of delinquents, a special charm can be found in every square meter of asphalt. These cities feel well-traveled and it’s worth it just to stop and take a look around to see the amount of detail that the developers have crammed into a few square kilometers. 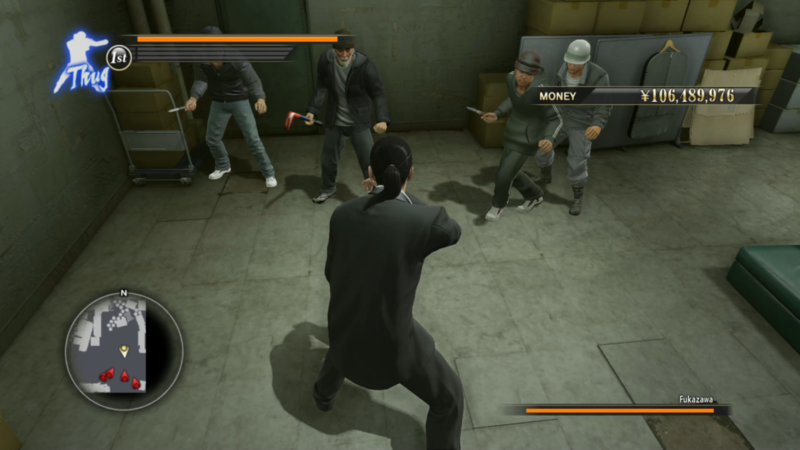 Part of the charm to Yakuza 0 is being able to take a step back from the story and just move at your own pace through the numerous side activities at Kiryu and Goro’s disposal. Being an ex-yakuza real estate manager can be hard work, so being able to unwind and belt out a few notes at the local karaoke dive or racing slot cars prove to be meaningful distractions from the crime drama. Even when faced with a life-or-death situation to rush to the next story beat, I took a few hours of indulging the local citizens in side quests or engaging in the weapon crafting systems in hopes of earning a stronger katana. One such side activity placed Kiryu into the role of bodyguard for Popstar Prince Michael Jackson Miracle Johnson as he moonwalked his way through zombie-infested streets to shoot his latest music video, only to be rewarded with a nice pair of shoes that reduced random encounters. Hitting the streets and solving the plights of the common man (and woman) are also the key to leveling up Kiryu and Goro’s fighting prowess. Eschewing the experience point system of other RPGs, these gentlemen power up with the use of a cold cash infusion. That is to say, copious amounts of yen are all you need to become a more powerful fighter in the world of Yakuza 0; these aren’t small amounts of cash, either. By the time the Dragon of Dojima begins his transformation into the series badass we all know, you’re looking at hundreds of millions of yen to unlock the next ability. 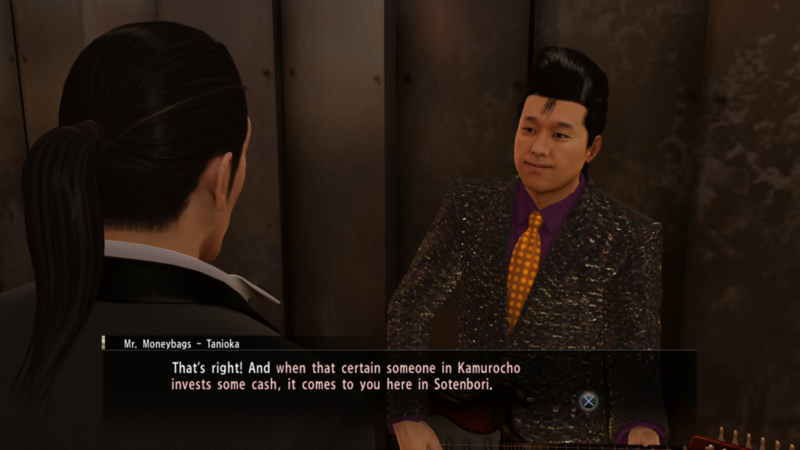 Thankfully the side content more than provides a simple surplus of cash, whether you’re using Kiryu to manage real estate on the side or Majima’s hands-on approach to managing an up and coming cabaret club. 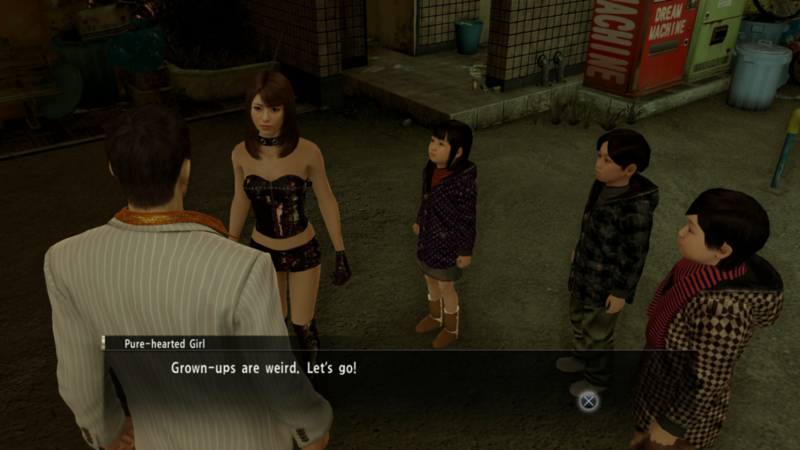 Despite its looks as a macho crime drama, Yakuza 0 has its quirky moments that help to establish itself as a series unique to PlayStation. To call the Yakuza series an action RPG would be no offense to the quality of the game. Though its methods to level up may be unconventional, the other hallmarks of a great role-playing game all hit their stride in Yakuza 0: a memorable story, character progression, and side content that helps to flesh out the world at large. It’s rare for an action RPG to break the thirty-hour mark before the credits roll. For the Yakuza series, players can expect realistically hit at least 80 hours before earning the elusive platinum trophy. Along the way, there’s so much content that dedicated players won’t get bored along the journey. Kamurocho is filled with the games of skill and chance that citizens of 1980’s Tokyo would’ve been right at home playing. Mahjong parlors, groups of homeless playing cee-lo at the park, and even trips to the local arcade to play OutRun are all part of the charm that gives Kamurocho a personality of its very own. Review code (digital) provided by the publisher. Whether you’re visiting Kamurocho for business or pleasure, be prepared to sink another eighty hours into a crime epic that only Sega can deliver.